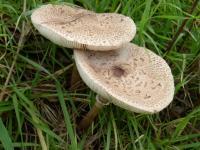 Amanita farinacea Photo E Collins Identify by the powdery meal on cap and stem. There are little warts on the young specimens and as they age they fall away. Photo E Collins Identify by the powdery meal on cap and stem. There are little warts on the young specimens and as they age they fall away. Bracket Fungus Photo N Bartlett A polypore on Red Stringybark. A wood rotting fungus. Photo N Bartlett A polypore on Red Stringybark. A wood rotting fungus. Ceratiomyxa fruticulosa Photo E Collins Sporangia on rotting damp wood. Found under damp bark.A beautiful slime mould. Photo E Collins Sporangia on rotting damp wood. Found under damp bark.A beautiful slime mould. 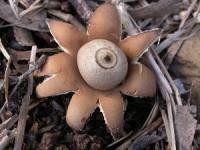 Cheilymenia raripiila Photo E Collins Dung fungi. Magnified the little cups have a rim of fine hairs. 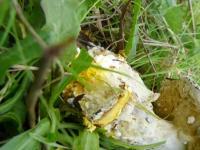 Photo E Collins Dung fungi. Magnified the little cups have a rim of fine hairs. 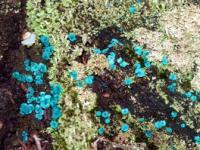 Chlorociboria aeruginascens Blue Stain fungus Photo E Collins On sticks and logs in June. 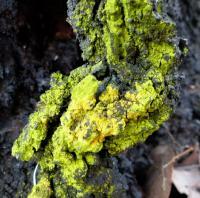 This fungus stains the wood it grows on a bright blue-green. Photo E Collins On sticks and logs in June. 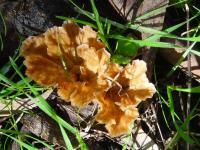 This fungus stains the wood it grows on a bright blue-green. Chlorociboria sp Photo J Heywood Similar to C aeruginascens but apparently does not stain the wood it grows on as much. Photo J Heywood Similar to C aeruginascens but apparently does not stain the wood it grows on as much. Chrysothrix candelaris Photo N Blair Gold Dust Lichen. 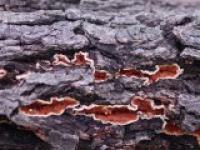 An iridescent lichen growing on Ironbark. July. Photo N Blair Gold Dust Lichen. 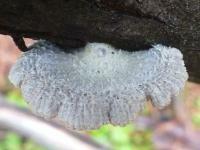 An iridescent lichen growing on Ironbark. July. 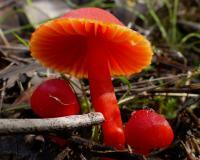 Coltricia cinnamomea Fairy Stools Photo E Collins. Grows on decaying wood and tree roots. The cap has radiating hairs which make it look like satin. Lovely when fresh. Photo E Collins. 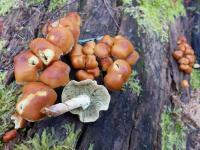 Grows on decaying wood and tree roots. The cap has radiating hairs which make it look like satin. Lovely when fresh. Coprinellus truncorum June Photo E Collins Growing in rotting woody debris. Interestingly flecked caps. Photo E Collins Growing in rotting woody debris. Interestingly flecked caps. 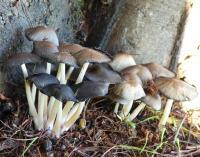 Coprinellus truncorum maturing May Photo E Collins Forms dense colonies at base of stumps and on rotting wood. 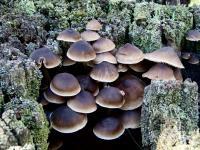 Photo E Collins Forms dense colonies at base of stumps and on rotting wood. 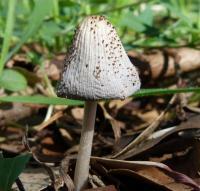 Coprinus micaceus Photo N Blair Glistening In Cap. 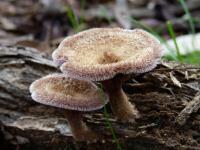 A delicate, short-lived fungi that autodigests to a sticky black mess. Spores are black. Photo N Blair Glistening In Cap. 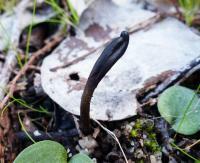 A delicate, short-lived fungi that autodigests to a sticky black mess. Spores are black. 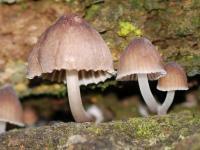 Coprinus micaceus. July jpg Photo E Collins Glistening Inky Cap. 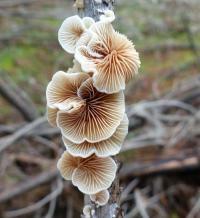 An exquisite and delicate fungi. Short lived as it auto digests into a black gelatinous mass. Photo E Collins Glistening Inky Cap. 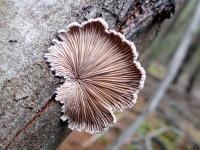 An exquisite and delicate fungi. Short lived as it auto digests into a black gelatinous mass. Cortinarius abnormis Photo E Collins Cortinarius abnormis. May. 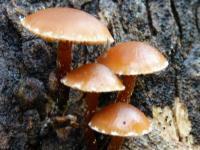 On rotting wood and in adjacent soil. Spore print brown. 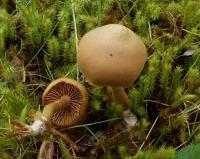 Photo E Collins Cortinarius abnormis. May. On rotting wood and in adjacent soil. 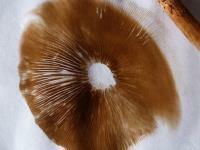 Spore print brown. Cortinarius abnormis and Fungus Fly Photo E Collins Several flies of about 1.2 cms in length were in attendance on this group of fungi. 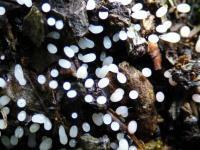 They were Fungus Flies, Tapiegaster sp. Males defend a site and await a female to mate with. There were three of these sitting quite still on the group of fungi. Photo E Collins Several flies of about 1.2 cms in length were in attendance on this group of fungi. 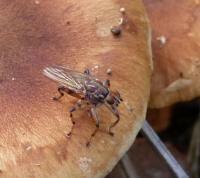 They were Fungus Flies, Tapiegaster sp. Males defend a site and await a female to mate with. 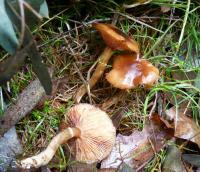 There were three of these sitting quite still on the group of fungi. Crepidotus sp Photo J Heywood Grows on wood. This fungus has very short stems. See adjoining photo for the underside view. Photo J Heywood Grows on wood. This fungus has very short stems. See adjoining photo for the underside view. Crepidotus sp Photo J Heywood Here jan shows the attachments and the arrangement of the gills. A nice pair of photos..
Photo J Heywood Here jan shows the attachments and the arrangement of the gills. 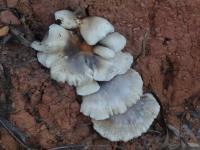 A nice pair of photos..
Cystoderma amianthinum Photo N Blair Grainy-stemmed cystoderma. September. Among moss beds in shaded areas. 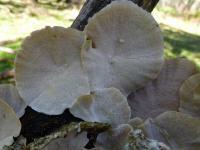 Photo N Blair Grainy-stemmed cystoderma. September. Among moss beds in shaded areas. Dictydiaethelium plumbeum September Photo E Collins A brilliantly colored slime mould. 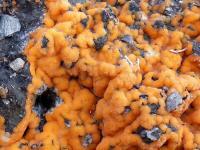 Photo E Collins A brilliantly colored slime mould. Dictydiaethelium plumbeum maturing Photo E Collins The red slime mould took just three days to mature to this stage. Amazing transformation. Photo E Collins The red slime mould took just three days to mature to this stage. Amazing transformation. Fistulinella mollis Photo E Collins One common name is Marshmalllow fungus. 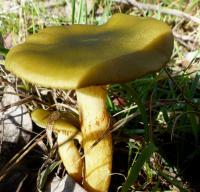 It is a member of the fleshy-pore group boletes. The pore tissue is very soft and bruises easily. August. 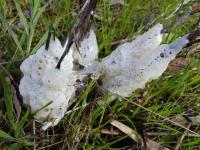 Photo E Collins One common name is Marshmalllow fungus. 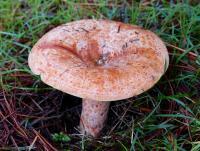 It is a member of the fleshy-pore group boletes. The pore tissue is very soft and bruises easily. August. Gymnopilus junonius Gold Caps Photo E Collins May June.On dead wood.This common fungus is spectacular in large clumps. 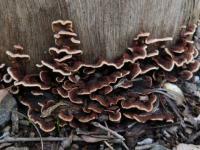 Photo E Collins May June.On dead wood.This common fungus is spectacular in large clumps. 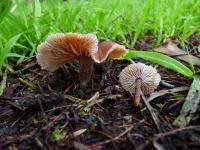 Hygrocybe sp. Photo N Blair Waxy-gills. A small colorful species, August. Photo N Blair Waxy-gills. A small colorful species, August. Hypholoma sublateritium Photo N Blair Common name is Brick Caps. On dead or living trees in big clusters. 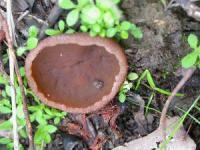 The spore print is dark purple. Photo N Blair Common name is Brick Caps. On dead or living trees in big clusters. 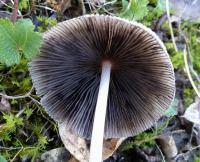 The spore print is dark purple. 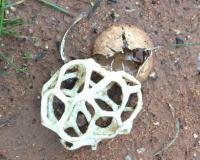 Ileodictyon cibarium Lattice Fungus Photo by Andrea Excell In July This amazing fungus begins life as an "egg".At maturity the case splits and the spore bearing lattice pops out.It is uncommon. 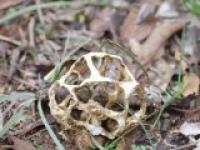 Photo by Andrea Excell In July This amazing fungus begins life as an "egg".At maturity the case splits and the spore bearing lattice pops out.It is uncommon. 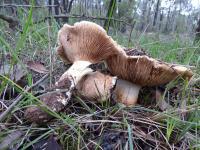 Lentinellus aff ursinus Photo J Heywood This photo was taken near Wangaratta. Growing on dead wood. Photo J Heywood This photo was taken near Wangaratta. Growing on dead wood. 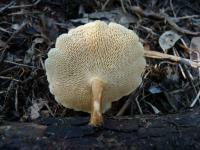 Lepiota sp Photo N Bartlett An interesting and beautiful photo. Photo N Bartlett An interesting and beautiful photo. 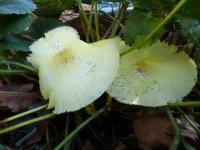 Leucocoprinus birnbaumii Photo E Collins Often found in pot plants emerging after rain and in humid weather. Dainty bell-shaped at emergence and later flat. 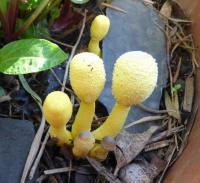 Photo E Collins Often found in pot plants emerging after rain and in humid weather. Dainty bell-shaped at emergence and later flat. Leucoprinus birnbaumii Photo E Collins This photo was taken twelve hours after the previous one and twelve hours later the fungi had shrivelled. They are delicate have a very short life indeed. Photo E Collins This photo was taken twelve hours after the previous one and twelve hours later the fungi had shrivelled. They are delicate have a very short life indeed. Lycoperdon scabrum Photo E Collins A puffball. The scales fall off as it matures leaving a smooth skin. 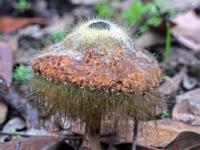 The spores are emitted through the apical hole which develops on maturity. Photo E Collins A puffball. The scales fall off as it matures leaving a smooth skin. 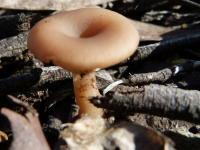 The spores are emitted through the apical hole which develops on maturity. 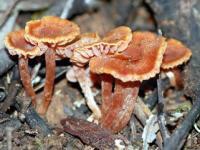 Marasmiellus affixus Photo S Jakovic The common name Little Stinker seems harsh for this beautiful little fungi. However it does have an unpleasant odour. 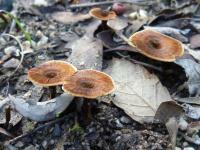 Found on the dead wood of eucalypts. 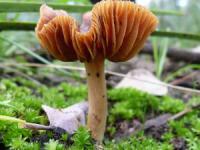 Photo S Jakovic The common name Little Stinker seems harsh for this beautiful little fungi. However it does have an unpleasant odour. 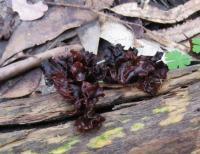 Found on the dead wood of eucalypts. Mycena yuulongicola Photo E Collins Nestled in a lichen clad old stump. The lichen is a Cladia sp. The ones in the foreground have become bell-shaped and are older. Photo E Collins Nestled in a lichen clad old stump. The lichen is a Cladia sp. The ones in the foreground have become bell-shaped and are older. Native Bread Laccocephalum mylittae Photo E Collins This huge fungi appeared at the base of a burnt out stump after a fire.Used as food by Aborigines. Photo E Collins This huge fungi appeared at the base of a burnt out stump after a fire.Used as food by Aborigines. 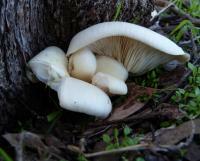 Omphalina chromacea Photo N Blair Yellow Buttons. Grows on bare areas and bare trackside banks which also support algae and moss. August. Photo N Blair Yellow Buttons. Grows on bare areas and bare trackside banks which also support algae and moss. August. Omphalotus nidiformis Photo E Collins Another wood rotting fungus. 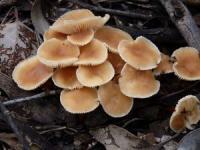 Coming in many shapes and found on stumps and logs, this fungi produces luminescence at night, glowing green. It is poisonous. May June and perhaps at other times when conditions are favourable. Photo E Collins Another wood rotting fungus. 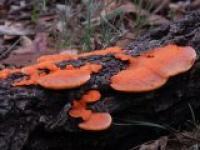 Coming in many shapes and found on stumps and logs, this fungi produces luminescence at night, glowing green. It is poisonous. May June and perhaps at other times when conditions are favourable. Pholiota communis Common pholiota 2 Photo E Collins In pine forest in June. 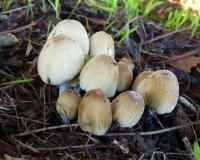 The stems are finely hairy and scaly at the base. Photo E Collins In pine forest in June. The stems are finely hairy and scaly at the base. 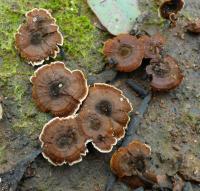 Podoscypha petalodes Photo J Heywood Rosette Fungus, Aptly named as it forms little colonies of rosettes. Found on the ground and around tree bases. 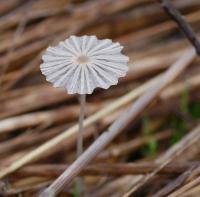 Photo J Heywood Rosette Fungus, Aptly named as it forms little colonies of rosettes. Found on the ground and around tree bases. Polyporus arcularius Photo J Birckhead Notable for its coffin-shaped pores. On dead wood. July. Photo J Birckhead Notable for its coffin-shaped pores. On dead wood. July. Pycnoporus coccineus Scarlet Bracket Fungus Photo E. Collins Common on dead wood. Photo E. Collins Common on dead wood. Pyronema amphalodes Photo N Blair As the name suggests this tiny mass of fungi occurs after fire. 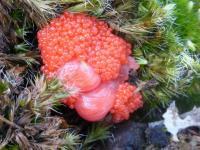 The fruiting bodies are tiny and mass together to form a colony. Photo N Blair As the name suggests this tiny mass of fungi occurs after fire. 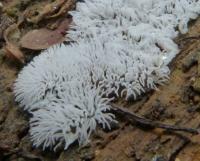 The fruiting bodies are tiny and mass together to form a colony. Schizophyllum commune Photo N Blair Not until one looks below this cap is the intricacy of this fungus revealed.Common on dead wood. Photo N Blair Not until one looks below this cap is the intricacy of this fungus revealed.Common on dead wood. Schizophyllum commune Photo N Blair, Common name is Split Gill. 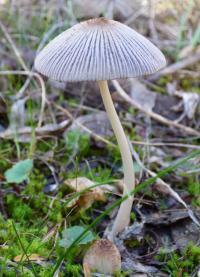 It is usually found on clusters on dead wood.The gills are split hence the common name. As it ages it becomes grey and somewhat leathery. Photo N Blair, Common name is Split Gill. 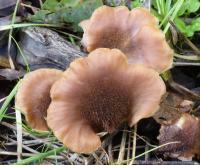 It is usually found on clusters on dead wood.The gills are split hence the common name. As it ages it becomes grey and somewhat leathery. Tremella fimbriata Photo R Sharpe Common name is Brown Witches Butter. 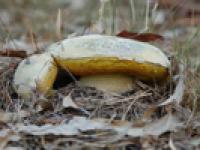 It is one of several Tremella species found in the park. Photographed at Mt Pilot in July. Photo R Sharpe Common name is Brown Witches Butter. 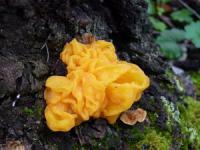 It is one of several Tremella species found in the park. Photographed at Mt Pilot in July. Tubifera ferruginosa Photo Jan Heywood An attractive Slime Mould found on wood. 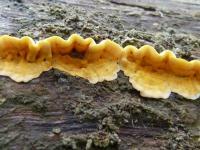 Photo Jan Heywood An attractive Slime Mould found on wood. Unamed fungi Photo E Collins Taken in September. In deep leaf litter. Photo E Collins Taken in September. In deep leaf litter. Unnamed Photo E Collins Taken in September. Height 8cms. Photo E Collins Taken in September. Height 8cms.